It is a van-based MPV, but that means plenty of space and practicality for bigger families or for larger travel groups who need to get from point A to point B. 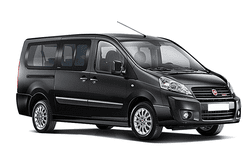 With high safety features, good mileage on fuel, comfortable interior, enough room for 9 people, great cargo space, and customization options it is easy to see why the Fiat Scudo is a popular choice for car rental centres in the area. No matter what your reasons are for needing a rental car, the VW Golf Variant is a great choice that will not disappoint! It has great power and control and blends luxurious comfort with luxurious style in a vehicle that is user-friendly and attainable by all. Check it out for yourself today and see how luxurious vans can be!